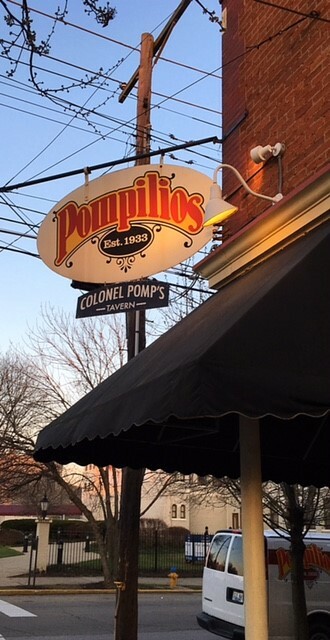 Pompilio’s, located in a historic neighborhood in Newport, is one of our favorite restaurants, and it’s only five minutes from downtown Cincinnati. Walking into this restaurant is like walking on to the set of your favorite gangster movie. A charming restaurant full of history, Pompillo’s was opened in 1933. It was granted one of the United States first post-Prohibition liquor licenses. I do have to tell you that this is the restaurant that was famous for having a scene in the movie “Rainman.” One of my favorite scenes is when Raymond reveals his numerical skills by remembering the waitress’s phone number and counting scattered toothpicks. When we walked in we were warmly greeted and taken to the bar to enjoy a drink while we waited for our table which didn’t take long. This is one of the few restaurants in Northern Kentucky that serves Guinness on tap. The bar has excellent service and a great wine selection with moderate prices and a good size pour. It was nice to sit and relax at the bar with a drink first. There are three comfortable dining rooms. The ambiance was romantic—dimly lit, with Italian style decorations, bottles of wine, vines and such. Pompillio’s serves authentic Italian cuisine in huge servings so you won’t go home hungry. The pasta is homemade daily and the sauce is fantastic! They’ve been using the same recipes for over 60 years. You can find jars of their popular marinara sauce at your local grocery store. We were seated at a cozy table by a beautiful stained glass window. 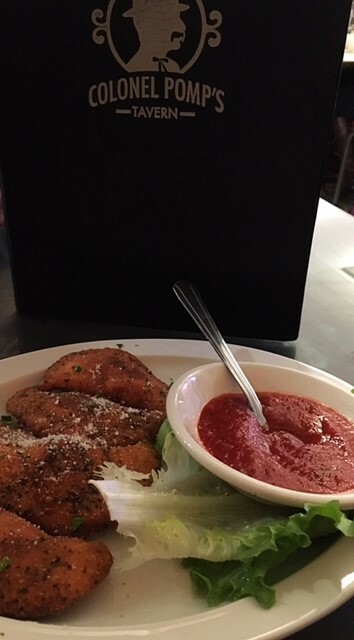 For an appetizer we tried the Toasted Meat Ravioli. It was different and very good! 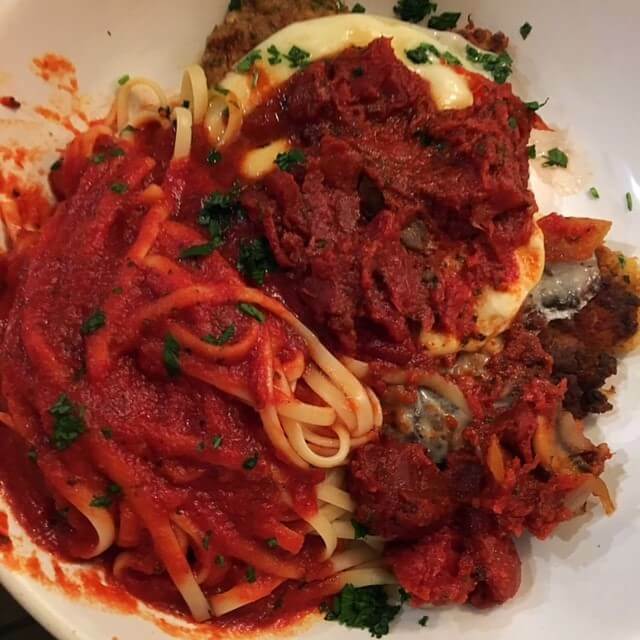 For the entree Scott chose the Chicken Parmigiana served with linguine marinara. And let me just say, he LOVED it! 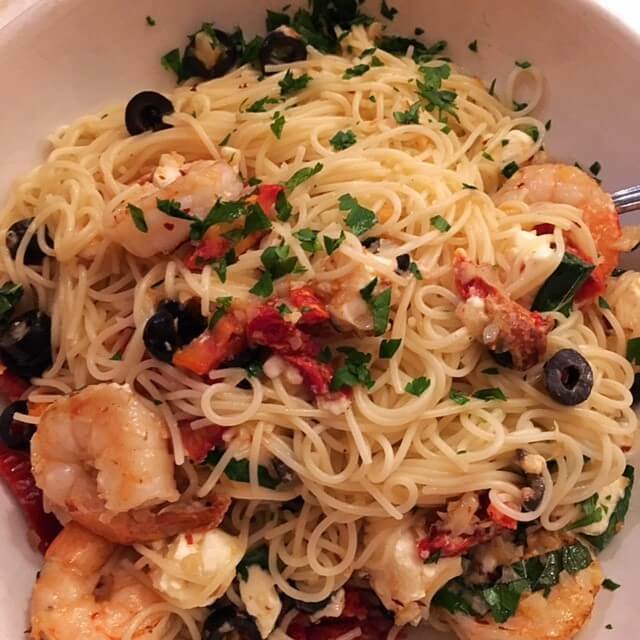 I chose the Shrimp Ronaldo with oil and garlic, sautéed sun dried tomato, feta cheese, black olives and fresh basil tossed in angel hair pasta. There were plenty of nice sized shrimp. This dish was amazing and had a little kick to it. 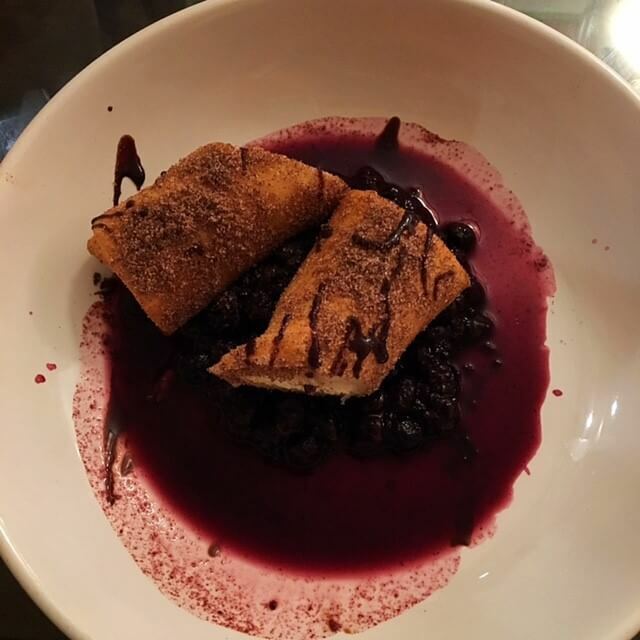 Of course we had to have a dessert so we chose the Fried Cheesecake with blueberry sauce. It was WONDERFUL! The cheesecake was fried in a crispy cinnamon sugar coating. The people around us were drooling as we devoured it. You can enjoy dinner at Pompilio’s for less than $50 per couple. I recommend getting a reservation as they stay busy. If you visit on the weekend, you can hear live music and dine al fresco on the patio out back. 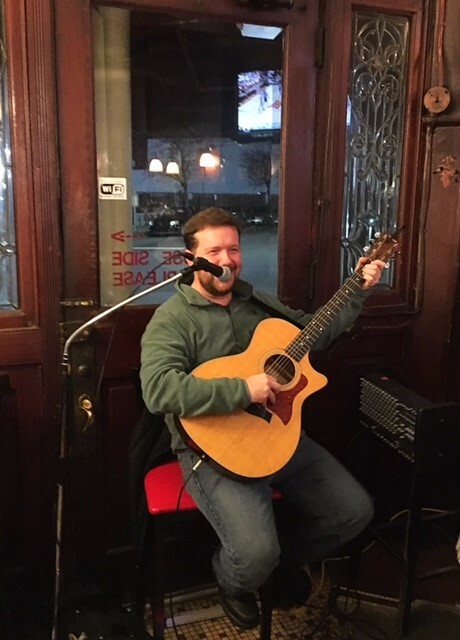 We were thrilled to find out that our favorite local musician, Mike Liggett, was singing that night in the bar. What a special treat. He engages with the audience—talks, sings and is a captivating storyteller with a wonderful voice. Check the online schedule for Bocce Ball open play nights or to join a league. Either way, it’s a great way to turn a regular dinner into a fun date night experience. All in all, I highly recommend dining at Pompilio’s. 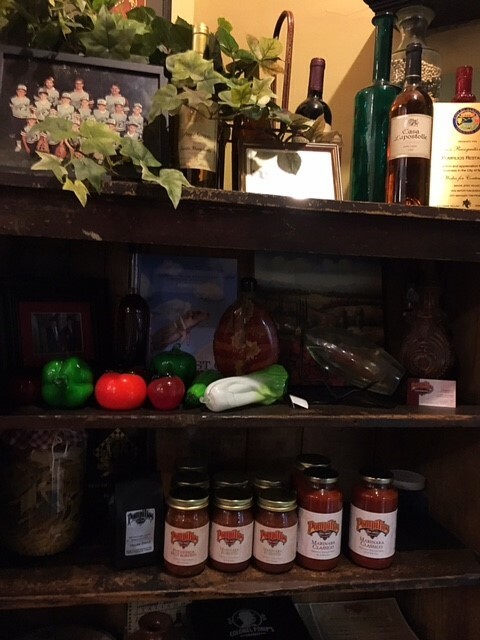 They have a wide selection of menu items, wonderful Italian dishes, big portions, fair prices, a nice bar, and a nostalgic atmosphere. This post is a re-share from my partnership with Date Night Cincinnati. All opinions are my own.